On a day marked by grief and a groundswell of public sympathy, the body of Tamil Nadu Chief Minister and AIADMK general secreatry Jayalalithaa was buried with full state honours on the Marina beach here on Tuesday. She was laid to rest at the MGR Memorial beside her political mentor and former Chief Minister M.G. Ramachandran, who was buried there in 1987. The State capital and the rest of Tamil Nadu remained incident-free through the day. V.N. 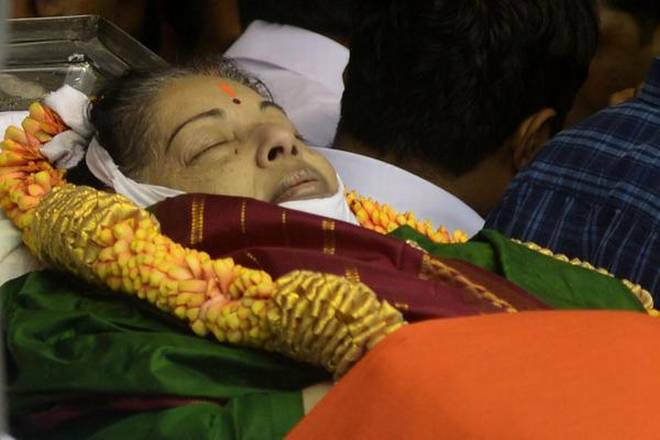 Sasikala, her close confidante of three decades and more, and Jayalalithaa’s nephew Deepak Jayakumar, her late brother’s son, performed the last rites as darkness crept over the beach, where thousands had gathered to bid adieu to one of the country’s most charismatic political leaders. Early on Tuesday morning, the body was moved from her Poes Garden residence to Rajaji Hall abutting Anna Salai. There, thousands of ordinary people filed past, and political leaders and other notables paid their last respects. President Pranab Mukherjee and Prime Minister Narendra Modi paid homage to the six-time Chief Minister of Tamil Nadu and undisputed leader of the AIADMK from 1989. Congress vice-president Rahul Gandhi stayed till the end. As many as nine Chief Ministers representing diverse parties — Devendra Fadnavis, Akhilesh Yadav, Naveen Patnaik, Pinarayi Vijayan, N. Chandrababu Naidu, Shivraj Singh Chouhan, Siddaramaiah, V. Narayanasamy and Arvind Kejriwal — paid their respects, as did many senior political leaders from around the country. “She was not a leader of Tamil Nadu. She was a national leader,” Rahul Gandhi said. Thousands of people, many of them AIADMK partypersons, lined the road and chanted ‘Puratchi Thalaivi Vazhgha’ (Long live our revolutionary leader) as the flower-bedecked cortege, which moved at 4. 15 p.m., passed. The distance of less than 2 km to the beach took around an hour to cover. A distraught Ms. Sasikala and her relatives were beside the body through the day. Her composure broke down when Prime Minister Modi consoled her with a hand held above her head. Tamil Nadu’s new Chief Minister O. Panneerselvam also could not control his tears when Mr. Modi attempted to comfort him with a hug. Ms. Sasikala was clearly moved also when actor Rajinikath consoled her with a hug after offering his respects to his neighbour at Poes Garden. The presence next to the body at Rajaji Hall of Ms. Sasikala’s husband M. Natarajan, who Jayalalithaa had kept at a distance for years, set political tongues wagging. Speculation about his role going forward increased when Mr. Natarajan was introduced to both Mr. Modi (by senior BJP leader L. Ganesan) and to Mr. Rahul Gandhi (by TNCC president Su. Thirunavukkarasar). After President Pranab Mukherjee paid his last respects, the coffin was carried by armed forces personnel and placed in the cavalcade. It passed through Anna Salai and Wallajah Road crossing the statues of Dravida Kazhagam founder Periyar and DMK founder C.N. Annadurai en route to the burial spot. After the final rites, which were guided by a Hindu priest, the sandalwood casket with Jayalalithaa’s body was lowered shortly after 6 p.m. with state honours and a gun salute. The body was draped in a sari in her favourite green and with some gold jewellery. The casket had her name and title etched on it in both Tamil and English -- Puratchi Thalaivi Selvi J Jayalalithaa. The memorial to MGR is aligned with the spot of Tuesday’s burial overlooking the Bay of Bengal. Another memorial to former Chief Minister C.N. Annadurai stands nearby.